Sisterhood of the Crafty Pants: Free Baby Top Pattern! 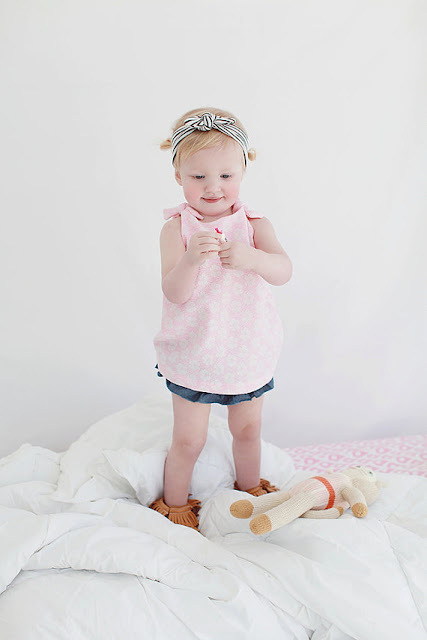 This little tunic top is so quick and easy to make (and really cute, but I might be biased)! No zippers or buttons! I digitized this pattern and wanted to share the 0-3 month size. It would make a perfect baby shower gift. To get the pattern in all sizes up to 4T, including dress length option, check out my etsy shop. I've got other cute dress patterns in there, and they're all affordable and easy to make! Here's the PDF file of the free printable pattern and instructions. *this pattern is for personal use only! Sweet pattern, very cute! I decided to make it reversible, though, so I'm going to cut out outer pattern of both fabrics (skipping the facing, obviously). Thanks for the great idea!